Indian authorities have started mass cremations of dead bodies in the flood-hit northern state of Uttarakhand’s holy town of Kedarnath even as nearly 4,000 survivors are still waiting to be evacuated from the mountains, a senior official said on Thursday. 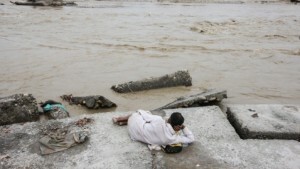 India’s Health Department has warned people in adjoining areas not to consume river water as it may be highly polluted. The department has expressed apprehensions about the spread of various infectious diseases. “We are now quickly cremating the bodies which have been recovered. But given the scale and nature of the tragedy, there is a likelihood that many bodies could still be lying in open spots, where rescue personnel have not been able to find or reach them,” said Ravikanth Raman, nodal officer of rescue operations in Guptkashi. According to official figures, so far 822 people have lost their lives in the Uttarakhand disaster. Air rescue operations to evacuate stranded people from Badrinath were halted this morning due to weather conditions. “A total of 18 bodies have been cremated so far in Kedarnath. The next round of cremation will start only after formalities like identification, DNA sample preservation, post mortem of the bodies are completed,” senior police official Sanjay Gunjyal, under whose supervision the exercise is taking place, told the Indian state news agency.